Frank goes to a lot of effort to select hives in the fall and set them aside for testing. He culls those that don't pass the tests and re-sorts them. In the spring, the process is repeated with our tests. Outside independent researchers then come to Stonyford to run a battery of tests. We get the analysis back from the lab and use this information in our selection process. Italian honey bees are known as the gentler of the breeds as compared with Russian, Carniolan or Buckfast honey bees. Italian bees are especially good for beginning beekeepers, and those who prefer to work bees in a short sleeve shirt to stay cooler. Frank usually works his bees in a short sleeve shirt as well as our queen cagers who prefer short sleeves. Some queen cagers even wear shorts in the summer. Italian honey bees are known for their quick brood build up in the spring and thus larger populations of bees for honey production. This makes our bees excellent for large bee populations going into Almond Pollination, and ready to be divided or supered for honey production when they come out of pollination. Get the hives supered in the spring and you will be prepared for a great honey crop! 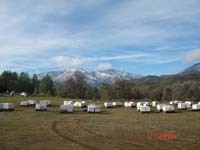 We take great care to select the very best hives from our outfit to use as breeders. We particularly select for hygienic behavior. We use Nitrogen testing at a 24 hour interval to identify the most hygienic hives. Stonyford, California is in Northern California just a few miles from the Mendocino National Forest. Our town has about 300 people in it, one beekeeper (us), and one general store where we buy our food, gas and sundry items. The biggest industries in our town are cattle ranchers and those who work for the national forest service. All that cattle land makes it possible to raise queens free of any agricultural spraying of row crops or orchards. Please explore our site to learn more about us and our bees. If you have any questions about Cordovan Italian Queens, our breeding program, or want information about how to order, please call us at (530) 963-3062 or (877) 963-3062. At Pendell Apiaries we strive to create high quality, genetically strong honeybees that can resist mites and disease naturally. We do this by breeding for hygienic and grooming behavior to reduce and control varroa mite populations. All our Pendell breeder queens are carefully selected from the strongest and healthiest hives after a series of tests to determine their genetic fitness. We have incorporated Varroa Sensitive Hygiene (VSH) trait into our stock using instrumentally inseminated breeder queens for over 10 years. 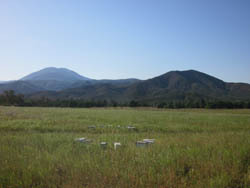 hives and/or bees for their research. 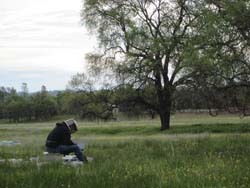 As the 2011 President of the California State Beekeepers Association, and chair of the CSBA research committee for many years, Frank Pendell has worked to secure much-needed funding for crucial areas of honeybee research.